Extreme speeds to catch your best shots, plus UHS Video Speed Class 30 (V30) and UHS Speed Class 3 (U3) ratings deliver the video recording performance you need for 4K UHD and Full HD video. 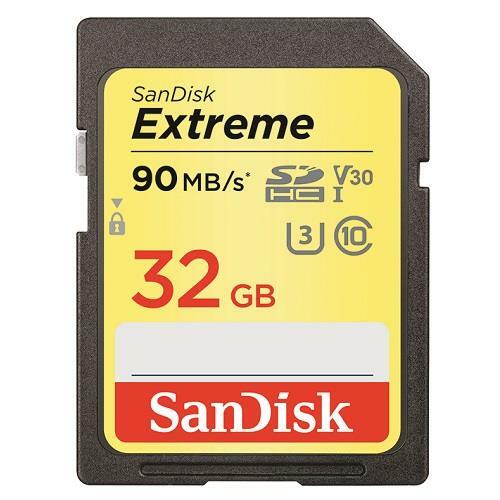 Available in storage capacities from 32GB to 256GB with read speeds up to 90MB/s to move files fast, these cards are compatible with SDXC supporting devices and come with a lifetime warranty. With the latest UHS Speed Class 3 (U3) ratings, SanDisk Extreme PLUS SDHC UHS-I cards let you capture uninterrupted 4K UHD and Full HD video. This makes it ideal for recording outdoor adventures, weekend trips, or sporting events without dropping frames. SanDisk products are constructed to the highest standards and rigorously tested. You can be confident in the outstanding quality, performance and reliability of every SanDisk product. Available in 16GB to 256GB capacity for longer video shoots and uninterrupted photo sessions.